We have to wait until May to see this on DVD but I was lucky enough to get an advance look. This is a recording of the live theater performance at the Adelphi Theater in London. The staging is spectacular and the performances are excellent. The score is sheer brilliance however I doubt if the public will take to it as they have to the score of “Phantom”. There will be those who will say that this show was written to cash in on the success of its predecessor and when it opened the reviews were lukewarm. 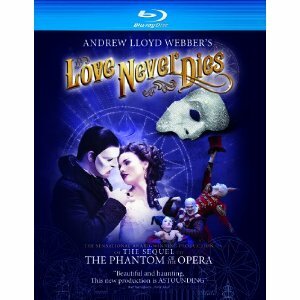 Andrew Lloyd Webber then reworked the show mostly during its Australian run and what we have now is not really a sequel but a story that uses some of its characters. The original London production was generally regarded as a failure and that is not what we see here. This is an all new, completely re-imagined and reconceived production with a new concept and new direction and a new cast. In fact, it does not even resemble the Australian production.